Looks like there is text in various fonts running diagonally on the cover. Maybe a reused something. It may Roesch (sp) ink blot test but at top is that a rate mark in pencil (possibly 5)? Also running diagonally underneath that is a what may be a very long word that handstamped. Further, not all express co covers have company service or rate markings. As an example, Siegel sale 1124 lots 260 & 274. Contents of lot 274 (datelined Lake Champlain) indicate writer is on tour east bound thru White Mountains to Boston from Lake Champlain & has come from Montreal. In my example, though there is no marking to indicate, I believe them both to have been handled by Virgil & Co. (taken to Pomeroys probably at Troy NY). Pomeroy's clearly did not service as far north as Lake Champlain. I have a box - maybe 10-12 pounds - full of permit mail (2nd, 3rd, 4th class including some colorful advertising) and BRMs (mostly unused) from the 1920s through approx 1970 or a bit later. Good study material, mixed condition. Free to anyone who wants to reimburse me for postage. Contact me offline if interested. Are there any contents? It looks like something is peeking out at the right. Where did it originate? Any chance it is a drop cover? While a drop cover should still have a rate or due marking, the marking could still be left off. Just as the PO should put a marking on the cover, I would think that an express company would do the same, so it may not be an express usage. In his 2010 article in the Chronicle Milgram lists a number of towns with advertised markings on stampless covers. Some are as early as 1840. Unfortunately Elmira is not one of them. I would check with him as in the intervening years he may have found an Elmira cover. Does anyone have an idea about the markings on this cover? It does not appear to have gone through the mails..................I have not checked the newspapers to see if an advertisement was run. Is this associated with one of the many express companies that operated in that area? My thoughts are that it is pre-July 1845. Interesting thoughts on presentations. Your first comment applies equally to Open (PDR style) Exhibiting as we will have at BALPEX. Do it your way. Our only restrictions are ownership, and the exhibit as a whole should be philatelically oriented. We have been running around 200 WSP frames for a few years, but have the frames and floor space for a significant number of non WSP exhibits. Your introductory exhibit idea is not out of the question. I have always considered an exhibit to be a presentation. I advocate using presentation software in preparing exhibit pages. To blur the line a little more, our ‘Exhibit Tour’ will feature short, (10 min max) presentations by willing exhibitors. This gives the onlookers the benefit of direct knowledge of the subject, and gives the exhibitor an easy way to try their hand at presenting if they have never done it before. Expanding on your description of laying pages on a table, I would welcome anyone who would like to give a full presentation at their frames. Seems like the next logical step. We could scheduled these as part of the presentation program. If one could take all the Hindenburg covers recently posted here, or even just their images, they could easily be cobbled into an appealing presentation. Just add a few mint sets of stamps such as (obviously) the Hindenburgs, earlier and later stamps to provide philatelic context: Famous Germans, Hitler Heads and maybe a few others from the period to give it more historical context, such as 1936 Olympics. How do you say "Voila!" in German? Google Translate says it's : "Voila". The great thing about giving a presentation is that unlike competitive exhibiting, you can do it any way you want. No restrictions as to what you can or can't include, and you can develop it gradually in advance and refine it after each time you give it, so that it just gets better. In the 'old' days it was normal for club presentations for everyone to sit at a long table with the presenter standing at one end, holding up album pages while expounding. Then everyone would stand up, the chairs would be pulled back, the presenter would lay out the pages on the table, and everyone would roam around looking at them, posing questions that the presenter would address and attendees would discuss. Taking into account the 'social' component of doing it this way, it's probably a more viable approach than ever before, obviously more tactile than powerpoint. And since you need to have the room fully lighted to do it this way, there's less chance that anyone will fall asleep. I'm pretty fortunate that my presentations always include providing attendees with a summary of the main points we'll touch on. Then I just talk for awhile, going down the list, after first assuring everyone that they should break in at any time with any questions. Last year I gave a presentation to a specialist stamp club and was 'interrupted' by so many excellent questions that I only got halfway through the planned presentation. Not being able to finish something constituted success! Since most of my presentations tend to be somewhat technical in nature, rather than unrealistically expecting attendees to absorb much of it in a short time, I provide everyone with several pages of printouts that they can take with them and deal with later when they have their own collections in front of them. My own Westpex presentation has eight such pages. DK, giving a presentation and having few or no people show up certainly is a daunting prospect, but that reaction is only human, and maybe it means that you have a conscience and for that reason alone are just the right person to do it. First time this happened to me, I resolved to try to come up with a presentation that would be of interest to a larger number of people. Rolled one out at last year's Pipex show, and it was very well received. Did it again earlier this year and will repeat the current improved version next month. I think the overriding consideration for shows to have lots of presentations is that their presence on the show's website will result in more people attending the show. It's been pointed out to me that expecting show sto devote any of their frames to a non-competitive US Introductory exhibit is impractical, as they need the space for competitive exhibits. To me, this is even more reason to have presentations, an obligatory one being the summary of US stamps, with dsplay. Here is a similar one but with a single 2c (address is faded or partially erased). The interesting thing to me about Dave's card is the name on it - Schmalzl. That was the maiden name of my mother's mother. A very unusual name from areas in southern Germany through Austria - several extended family members moved to the US including Illinois around 1910. This person is not in my family tree but I suspect there is a familial relationship. It is a fake attributed to Petrie. See page 223 of Peter W. W. Powell's work. 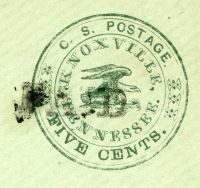 Petrie Fake (also the early Scott and Moens illustrations based on the Petrie fake) - The "V" of"KNOXVILLE" is under the "0" of"POSTAGE," and the "I" of"KNOXVILLE" is to the left of the "T" of"POSTAGE"
The scan is of my copy of the Petrie fake. On another chat a Knoxville CSA Envelope was questioned whether it was authentic. Underpaid by 5 pfennig, then equivalent to 6 1/4 gold centimes. Underpayment noted by German post office as 12 1/2 gold centimes, factoring in the UPU doubling penalty for underpaid international mail. Received in New York City and assessed 2 cents postage due (equal to the 12 1/2 gold centimes) by the Hudson Terminal Station. Two one-cent Parcel Post Postage Due stamps used to collect the underpayment, carefully placed so as not to obscure the address or message. It looks like Justice was at Kingston. The captured soldiers throughout the Jan-April period were brought to Kingston, North Carolina. General Hoke captured several thousand union soldiers at the Battle of Plymouth, North Carolina in April. It also looks like he appears in the "Murder of Union Soldiers in North Carolina" investigation by the secretary of War. Search "Justice" and his name appearsthree times. themselves, and that some did, and were sent to the regiment at  "Wilmington. Question. Where were you stationed in February and March, 1S64 ? Answer. At Kinston, North Carolina. Eleventh witness, John G. Justice, sworn : Am twenty-one years of age; reside  in Lincolnton,North Carolina. Here is the summary. I will be at Westpex on Friday only. Anyone wishing to say hi, look for the St. Louis Cardinals baseball cap. Last but not least is a post card sent in January of 1918 from a part of Germany that was located inside of Belgium, Prussian Moresnet. A short summary of the history is shown in the next post. Another reason I enjoy collecting Germania covers. 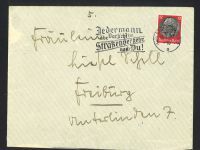 Below is a cover sent to Finland from Berlin on June 30, 1918. It is franked with two se-tenant pairs of 7 1/2 pf and 2 1/2 pf stamps from an automated coil machine, paying the 20pf foreign letter rate. This is a decidedly uncommon franking for international letters. Even more interesting is the history of relationship between Germany and Finland at the time this cover was sent. The Germans intervened on the side of the "Whites" against the "Reds" in early 1918, even as they successfully negotiated the Treaty of Brest-Litovsk with the "Reds" in Russia proper. The Finnish Whites defeated the Reds in a war that ended in May, 1918. In October of 1918, the crown of Finland was offered to the brother in law of the German emperor. The surrender of Germany in November happened before he was installed as King. Showing why I enjoy collecting Germania covers. Below is something you don't see very often. It is a Germania cover mailed on Aug. 17, 1914, after the start of WWI, which ended up in Great Britain, with a British stamp added. The cover was addressed to (neutral) Holland, then forwarded within Holland, then forwarded to Great Britain, and then forwarded within Great Britain. As a bonus, the cover was short paid, and the sender was from the US Embassy in Berlin. Two sets of Holland postage dues were added. I am one of those who is making a presentation at WESTPEX. It's sort of a challenge, asking whether you can include both picture postcards and covers (same subject, of course) in the same exhibit. My subject is Army troop transport ships from the Spanish-American War to 1950. I've done Powerpoints before, but I will say that there is nothing more discouraging for the presenter than to spend hours working on the project only to have a tiny handful of collectors show up. Shows need to make a very strong effort to promote these presentations, but collectors also need to support them to encourage presenters to continue these efforts. Thank you, Larry. The promotional material said there were no reserves. Maybe it will reappear in a sale that attracts more serious bidders. I have a group of covers selected for 3 cent shades -- mostly around 1852. I once looked at it from the viewpoint of when the envelopes began to outnumber the folded letters. I think the result was early (correction) 1853. However it could well be off because of differential survival of folded covers over envelopes. But probably not wildly off. Foreign transit letters probably transitioned later. One of my favorite transition covers (Ex Fisher, but I don't think he knew what he had and I almost let it go, catching on at the last moment) is a July 1, 1845 from New Jersey -- with envelope -- the first day it would go without an extra charge (under one half ounce total). Looks like it sold for 18,000 Euros. Pre-sale estimate was 100,000 Euros so it may not have met a reserve, if there was one. Does anyone know the hammer price for the Vin Fiz card auctioned by Classicphil yesterday in Vienna? Just for fun, here is the enclosure from that Blood's Penny Post cover, from the City Surveyor, 2nd District. Note the minature embossed shield and crown at top left. Under magnification it reads "Paris Paper". Nice imported stationery. Letter discusses surveying property, and depth of stakes. Note the P.S. "My young man tells me that the parties have fenced so much in. C.S.E" I suppose the young man was the city inspector. This image shows how strong the embossing is on the emblem on the flap of that "Safety Envelope". And shows that the flap was gummed. 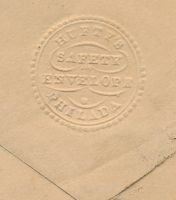 This Blood's Penny Post local post cover, dated 1859 from Philadelphia used a so-called "Safety Envelope". See Cover ID 28226. This image shows enlargement of the interesting fancy embossed emblem on rear flap. Why is this called a "Safety Envelope? I suppose because the rear flap is gummed, so that no wafer seal is needed. 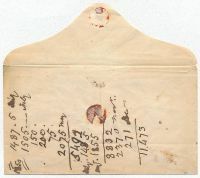 Early envelopes (late 1840s) such as the one I just posted frequently were manufactured without gum on the rear flap, such as this example. This image shows the flap opened, revealing that it was sealed with a red wafer seal. Which was the custom at the time for sealing folded letters. 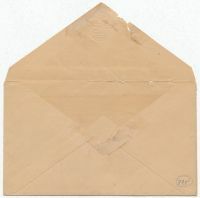 The First Issue Nesbitt envelopes of 1853 were called "self-sealing envelopes" because they had gummed flaps. Here is a 1847 5c red brown used on an envelope, from my collection. 1850 docketing on back. 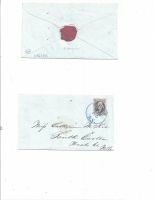 My other 1847 issue on cover are on folded letters, so I suppose usage on envelope is scarcer. See Cover ID 19895. Next post will have more information. Canal Zone APO 831 soldier messaged card blued? Possibly the card had been previously printed and not used. Coating the card allowed it to be used for other purposes. Yes, that was allowed. Westpex website currently shows approximately 23 presentations on a very wide range of subjects. Majority of these are not part of a society meeting. I feel stronger than ever that this is a direction that all shows need to go, and very aggressively. I applaud Balpex for attempting it, as I believe that all WSP shows need to justify their existence. In addition, I think that every US show should include one exhibit of a representative showing of US stamps 1847 (or earlier) to date, essentially a sampling of what one can collect. Put in some covers too; make all this come alive. Richard - I wish you and the other organizers great success! I am convinced that new approaches to exhibiting will benefit all those who are able to participate. A) Open Exhibiting Class. A live version of the PDR. Minimal rules. Judging by vote of the exhibitors. 1) For less formal exhibiting where new exhibitors can show material and receive suggestions and encouragement, without the overhead of the formal process. 2) For exhibitors who have serious philosophical differences with the current system and refuse to participate. 3) To try things that just don’t fit the current system. I plan to show several “Short Subjects” of a few pages each. 4) For collectors who just want to throw some material in the frames and say ‘Look at this neat stuff’. A great place for WSP exhibits in the making. B) “One of My Favorites” Class: Single item, single page exhibits. A place to single out a gem from your collection. This is just for fun, although there will be a peoples choice award. Simply mount the item, do a quick write-up, blow your horn a bit if you choose, and enter it. C) Exhibit Presentations: This will be an ‘Exhibit Tour’ with exhibitors giving short presentations at their frames. Participation is strictly voluntary. D) Classroom Presentations: Traditional 20 or 50 min presentations on varied philatelic subjects. We are currently seeking presenters and hope to have a strong postal history presence. E) Exhibitor Meet and Greet: Exhibitors are encouraged to be at the frames during this event to meet fellow collectors and exhibitors. Please consider attending. In planning this event, my thoughts were towards the members of this board. My thanks to Richard F for his encouragement. I hope to make this an annual event, but need the support of serious philatelists to make that happen. All BALPEX WSP classes remain available. Please contact me off board with questions. Message side of the government card seems to have been blued? Was there some purpose for this? Front side is normal and attached to second message. I just uploaded a book as well as several AR exhibits that David Handleman provided. They are PDF files and all are linked from Exhibits page here. APS is accepting applications for Chief Content Officer (i.e., editor of the American Philatelist, Philatelic Literature Review, and other publications and digital applications), Director of Expertizing, and Staff Accountant here. Hold your cards and letters, folks. Problem solved. Last one. My favorite, because it was posted in 1945. Crazy day today. So time for some crazy Hindenburg Medallion covers. I will show three of them. All of the "crazy" stamps shown on cover went through the mail. The stamps were produced by the German PO, including the centers on the bi-colored stamps, but the stamps did not look like they do now immediately after they were printed. It should not take long to figure out how they ended up looking like they do now, before the covers went through the mail.